The Cu Nim Gliding Club – Come soar with us! Welcome! The Cu Nim Gliding Club is a non-profit organization dedicated to sharing the sport of soaring. 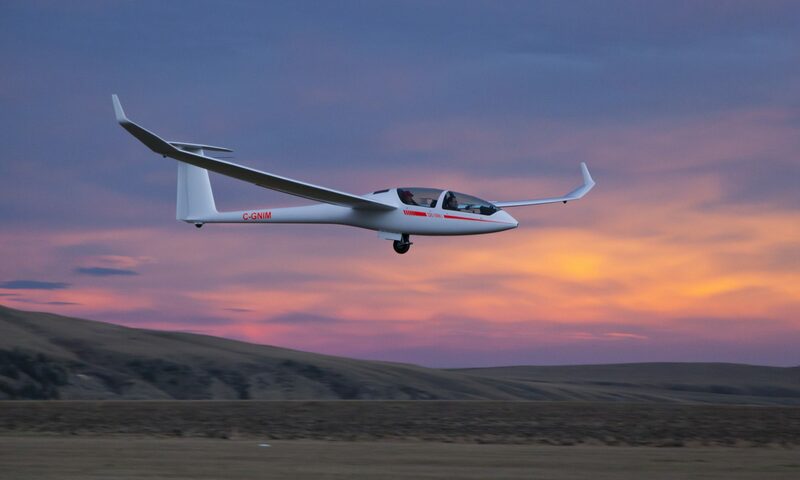 Our club is made up of roughly 60 passionate pilots, a dozen instructors, two high-performance two-seat gliders for training and mentoring, as well as three single seat gliders for licensed pilots to explore Southern Alberta. We are located just outside of Black Diamond, and serve anyone interested in gliding in Calgary and surrounding areas. We offer introductory flights to the general public, as well as a membership and associated privileges to licensed pilots looking for new challenges, and those wishing to learn to fly! No flight experience? No problem! We love introducing new people to the sport of soaring! Individuals can solo as early as age 14 (and start younger), and can license at 16. We have students from their teens to their 90s – soaring is relatively easy on the body and great fuel for the mind. Follow our story on Facebook and Instagram! Gliding is the sport of flying unpowered aircraft over long distances at high speed. With modern gliders, skilled pilots routinely fly 300, to 500 km in a single flight and stay up for many hours. In optimal thermal conditions, flights break 700, and wave flights beyond 800km. Cu Nim pilots enjoy incredible airspace with powerfully predictable thermal and wave conditions.